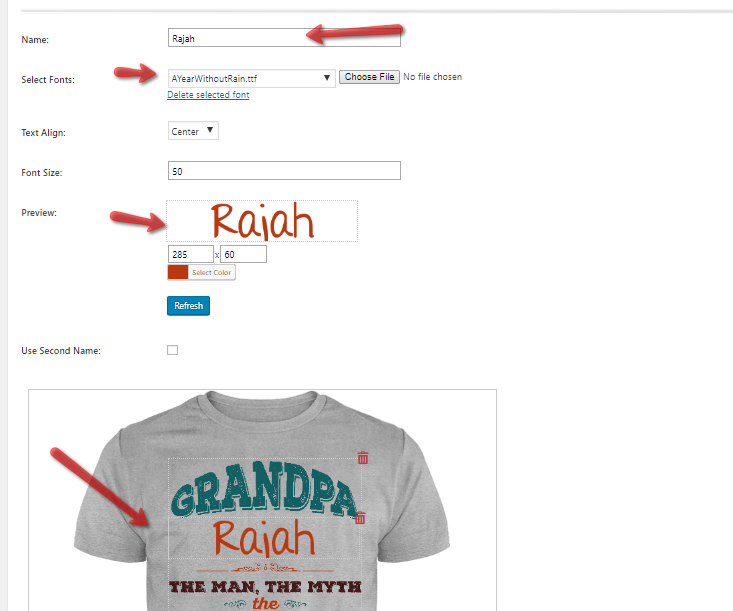 How to Resize Personalized Text : Celebrity Lifestyle Brands Inc. So...you want to make the personalized text on your product larger, or smaller. There are three parts to changing the text size. The light gray line/box around the font is the text container. The text container restrains the proportions of the text. The font size may be re-sized to fit into the text container. **Note: Not all font sizes are equal. Some fonts have taller or longer letters, especially handwritten fonts. Be sure to test out different words and letters to make sure the bottoms of letters like "j's" or "g's" or the tops of capital letters aren't getting cut off. You may need to try different settings until you like the font size on the mockup. Click refresh to see your changes on the product mockup image. If the text doesn't look like you want it to, adjust the settings and refresh again. Repeat this process until you are happy with the results. Be sure to save your changes. Notice how the bottom of the "j" is cut off. This is because the height of the text container box isn't large enough for the font size selected. Increase the height of the text container box. In this example, try changing "60" to "70" or "80" and test different letters to make sure the text isn't getting cut off anywhere.